What To Do With 5 Extra Minutes? 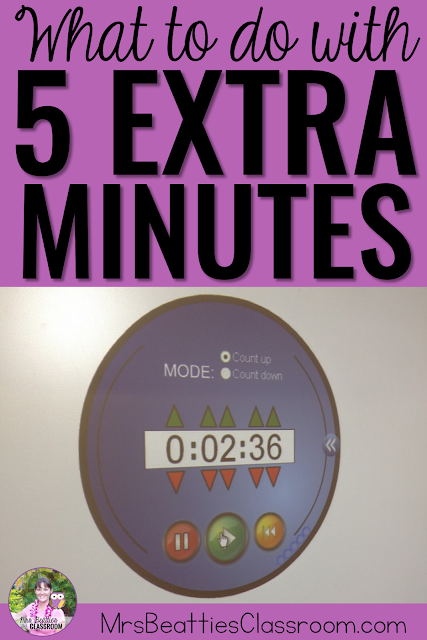 Do you ever struggle to find something meaningful to fill five minutes of instructional time? You know... not enough time to start the next chapter, too much time to begin packing up... I do. That five minutes can mean the difference between a productive day and a disaster, especially to a new teacher still finding their way with classroom management techniques. Well... I may have found the solution! My class actually asks begs to play my Multiplication Basic Facts "I Have, Who Has" Game! Several times a day!! A teacher's wish come true! We time ourselves as we go through all 30 cards, and today the kiddos smashed their record! Boy, were they proud! I love that they are so determined! Check out these great resources, perfect for filling your spare moments! Am I really first?? Yay! If we have a few extra minutes I like to read aloud to students, let them give a book commercial to the class (from "The Book Whisperer"), or do Social Studies flash cards. You ARE the first, and only! (But hey, I'm new...!) Congratulations, Donna! I'm sure your kids will love this! The added competition against themselves has motivated my class like you wouldn't believe! They beat their record AGAIN today... all 30 cards in under 2 minutes! :) Have fun! I'd love to hear what they think! Do you have any ideas of how to differentiate this activity but not make the children at a lower level feel "dumb". My class is very spread out in ability with some on a 3rd grade level and others into 5th grade (I teach 4th.) I love this idea but want some ideas of how to use it in that type of classroom. Hi Janalie! Thanks for stopping by! I can tell you that the class I last used this with was also very varied in their ability. I had created a classroom culture that encouraged risk-taking, and discouraged put-downs. Every student was so incredibly supportive of the others so no one I did purposely distribute the cards so that my struggling students each received one that was more manageable for their level. I did want to still challenge them, but not embarrass them, and I know I accomplished that. The students were all so motivated to beat their time that it really did encourage all to master the facts.